I've been by Mama Kat's again. I like the prompts, so to the den. I've chosen one and done my thinking. Keys are clicking, cursor blinking. not quite right, darn, take two. That sounds odd, it just won't do. Another pass? That's the third!! 10. Your personal work. Face it, we all have our own calling. We do what we felt driven to do. After pouring yourself into your work for a lifetime, do you really want to see it disappear with you? 9. Love letters. Love thy neighbor as thy self. A good rule to live by, but if we are lucky, even for a while, we find love. True love. The kind of love that makes you googly eyed and dizzy. The kind of love that keeps you up at night, not only while you are under it's spell, but even when it is gone, burned out and moved on. The kind of love that has you writing silly poems and leaving them where she is sure to find them. The kind of love that keeps you walking that line, huh Johnny Cash?? The kind of love that makes you keep trying to be a better person, so maybe, someday, they might come home. 8. Your family history. This, despite the previous item on the list, is the one about which I want to write. All of the items on this list are significant and most are tied together, but this one sticks out for more reasons than I care to name, so I will hit a couple of the more significant ones. First, I like family photos. I collect them, I take them, I distribute them, I collage them, I power point them, I doctor them, I have even scrap booked them (don't tell the guys on the rugby team, I'll never live that one down). Second, I like genealogy. I like to hear stories of what our family has done, places we have been, people we have known. History is learning, and how do you know where you are going, if you don't know where you have been? Case in point, I submit to you the above photo. 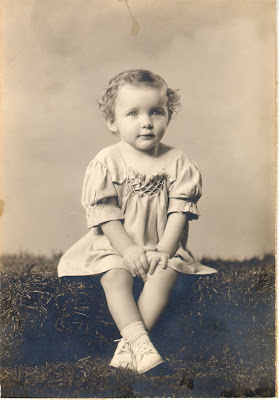 That is my mother at age two. Absolutely beautiful, eh?? It was taken somewhere around 1936, while she and her family still lived in Wisconsin. As she was the first of six sisters, I am not sure if any of her sisters had seen the light of day or not by then. But, I digress. If I had known of or seen that particular photo, I would have had one of my daughter made in a very similar pose. I now encourage all of my brothers to do the same with their children. My only sister beat me to the punch though. She gave me for Christmas, last year, a picture frame with three photos. I was in the middle, my daughter was on top and my son was beneath me. She had taken pictures of each of us in the same location, same pose, same light; and cropped everything but the face (and I mean she cropped it close). The likeness between the three of us was up-lifting. It really helps you realize that you are a part of them and they of you. I am trying to take it even further, though. I have found a picture of My mom's mom that matches one I have of my mother. I scanned the photo of my grandmother at the highest resolution I could get and went to work on it and my mothers photo. I have to get my only sister and my daughter to sit and I will have FOUR generations of the women from my family in the same picture theme. Should be awesome. I will post the results of my project and a close up of my sister's work in the near future. Much the same way as Becky was playing with her photos on her blog, I recommend this to all. You will be impressed with the outcome. Third, as you can see, I like to write. I try to record as many of the stories as I can from our family history. All kinds of stories, the good and the bad, touching or sad. I record them (secretly if I have to) and save them in my journals and writings, both blogged and hidden away. I even have all of my father's written stuff. Someday I will get his book published. Finally, I think family history is important for sentiment. And I find it hard to believe that some just don't get it. When my ex-wife left with the kids and all the boxes packed with stuff from our house, she did a pretty torough job. I'll keep it short, because I don't want to start sounding bitchy . As she was on her way out with the new tvs and the silverware and all the nice trappings that we had acquired over the span of our marriage, she failed to realize what she was leaving behind. She left her family bibles, childhood yearbooks, years of family portraits and timeless photos of many of her parents relatives. As I find these things in my house now, after living away for the last eight years, I am left wondering what to do with them as well as how she could possibly forget these things. I mean, when your house is on fire and you have time to run inside and grab a few things, what are you grabbing?? Are you grabbing the material items worth a few hundred or thousand dollars or are you grabbing those priceless memories that no pile of money can buy. At this time, I will keep them. I will even make sure they stay in her family in the future (she has one sister), but I am not sure if she will ever see them again in her life time. They say time heals all wounds, but I still have some time left apparently. And this is where I struggle with my love for self vs. love for her vs. love for her family. 7. Memories. When we think of our loved ones, whether they are gone on a trip or gone from this earth, they can never be taken from us. 6. Your family ties and friendships. Families are meant to be strong, as strong as we can make them. Blood runs thicker than mud, right? And then we all have friends who are so close they seem like family. Those are the kinds of relationships that make life memorable; solid and long. 5. Your marriage. After God and self, what could possibly matter more?. 3. The environment. The Lord made this wonderful place, who are we to destroy it? 2. Your honor/dignity. A lot can happen to us in this crazy world, losing pride is one thing, but honor is the gift you give yourself. 1. Your soul. God gives each of us free will, so the task is up to each of us ultimately. That's right kids; Tuesday IS my favorite day. That means Caption Contest time (and the crowd goes wild). This week I am going to try something different. The photo for the contest is from my personal collection. I took this during a road trip in the northern extremity of Texas. My son and I took my mother to the north. We were going to see my sister, but she and my favorite brother-in-law had high-tailed it to Mexico for the week. We found her teenagers hanging out at the house SOLO!! No big dealio though, they are smart good kids who seem to keep their noses clean. The Son had a blast with the cousins, I got some writing done and some photos taken, while Mom got to relax and spend time with the grandkids. Those two cousins were a good influence on The Son, he learned the inner workings of a potato cannon and a hover craft. He is now in full blown engineer mode, downloading stuff to build exciting new toys. Instead of a caption, per se, I want all entries to be your own written thoughts on this particular photo. I will post mine next Monday and I will award a prize to the author I deem to have the best submission. They say a picture is worth a lot of words, so let's see what some of those words are. Good Luck and enjoy your time composing.